Yes, they do make sweet little slips in babies', toddlers', and little girls' sizes! Now available in big girls sizes, too. 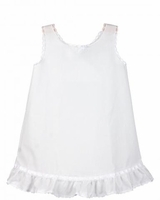 Here's a darling little cotton blend batiste slip trimmed with lace with a lap over back. 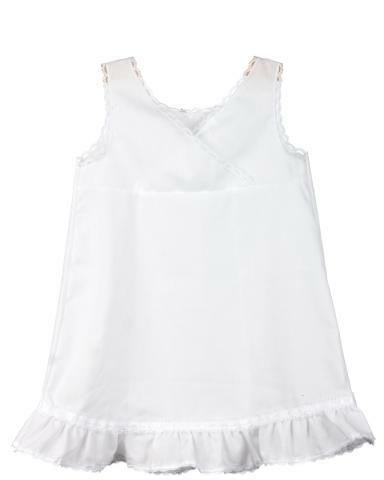 Perfect under all your little one's sheer dresses. So sweet and feminine for your baby, toddler, little girl, or big girl! These slips run small. Please measure carefully and order by length desired rather than by the baby's age. You should order a slip about an inch shorter than the dress you plan to wear it with. These slips will be very short under tea length bishop style dresses. You may wish to consider the Tea Length Bishop Style Slip for bishop style dresses.